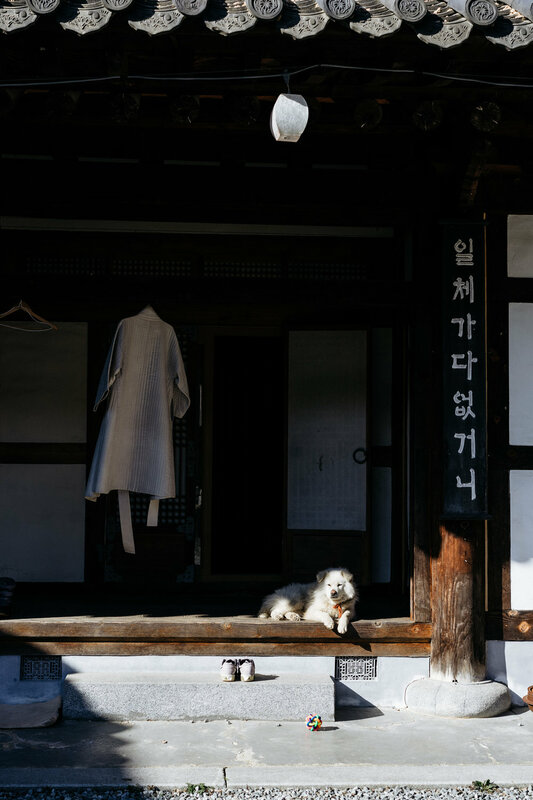 When I arrived at the Chunjinam hermitage, Jeong Kwan seunim was outside her house bustling around, lining up the shoes left in front of her terrace. “Good morning!” she yelled out brightly in English, then laughed at herself speaking a foreign language. Wrapped in grey ropes and almost a head shorter than me, she led me and another guest by the arm up a set of stone steps to the main temple. “Pay your respects and then let’s go downstairs and have breakfast,” she said familiarly, switching to Korean. After we completed our set of prostrations in the temple, she led us again past her house, down a set of stairs into a prep kitchen, then back outside to go further down the hill to a new annex. We finally arrived at her main kitchen, which is a combination of a large modern cooking studio and a separate, more traditional room with blush-coloured walls and antiques. In her kitchen for the first time, I was swept immediately into the warmth and bustle of a morning at Chunjinam. A man was stirring a pot of soup on the new stove while another nun with shaven head peeled nashi pears. A young woman popped her head in the door and asked if she should call the professor to breakfast. 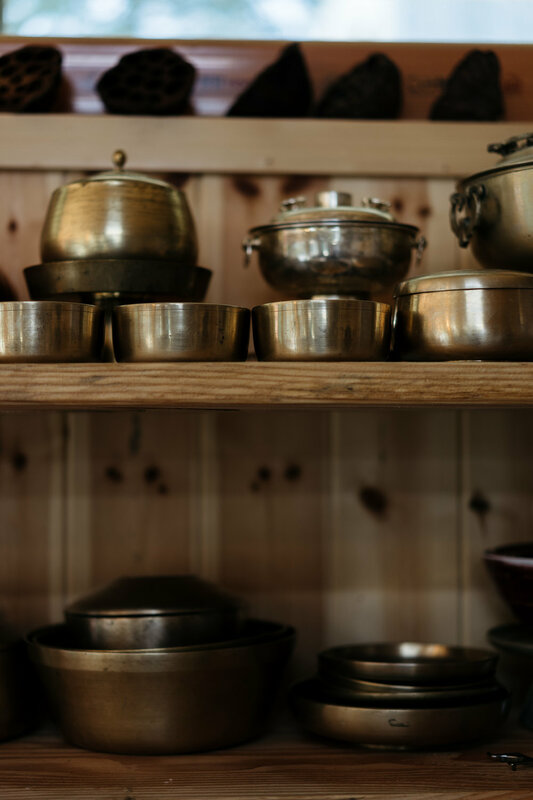 I stood still in the middle of the morning whirlwind staring at row upon row of shelves stacked with vintage Korean dishes and boxes. I was in Jeong Kwan’s kitchen. I tried not to pass out. I have been wanting to meet Jeong Kwan seunim and taste her food since I read about her in the New York Times in 2015. After I left my legal job last year, I tried for months to arrange a stay at her temple or at least a visit. Let’s just say it was not straightforward. As I wrote previously, the Korean government organises visitor stays at Buddhist temples across the country to promote cultural awareness. However, the hermitage over which Jeong Kwan seunim presides is not included in the Korean government’s temple stay program, though the larger temple of which she is a part is. Finally, it was my cousin who was able to track down the phone number for her hermitage and arrange my stay. Then I think what I call “the Netflix storm” must have rolled in. Two days before I was set to leave, my cousin called to confirm my stay one last time and was bombarded with questions about me. Who was I? What did I want? Was I a journalist? She was told that the nun would need to be consulted again and we would need to call back the next day. The day before I was supposed to go to Korea no one at the hermitage was answering the phone. My cousin said she would keep calling, bless her. Would I still fly to Seoul from Hong Kong, then make the three hour journey from Seoul by train and bus if we couldn’t reach her? I was in the middle of cooking for 165 people that evening and didn't have time to think about it. Chunjinam Hermitage is in Jeolla province in the south of South Korea, where both my parents’ families come from. 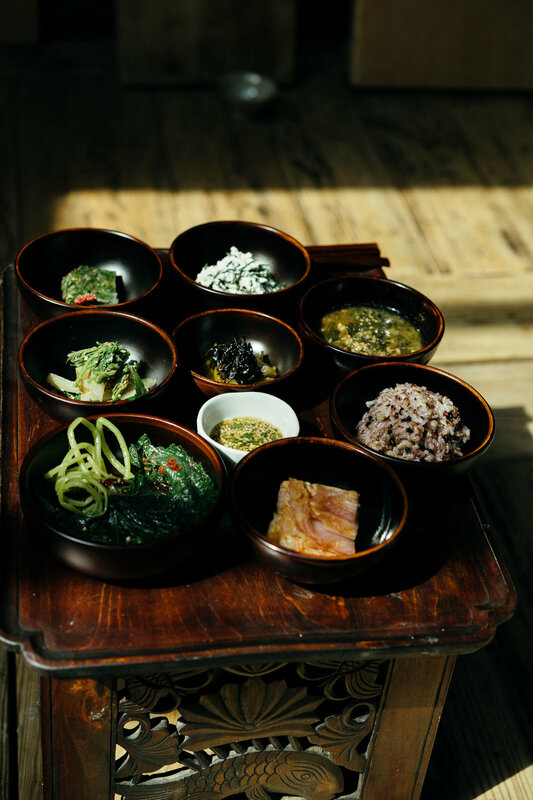 Jeolla-do is renowned for its down-to-earth cuisine, and the locals speak with a lilting accent and an unmistakable dialect of their own. The train I took to the south from Seoul stopped at Mokpo from where my mother’s family originated and I was tempted to stay on the train to visit my maternal hometown. But when the nun says come, you don’t dawdle. Jeong Kwan seunim is not from Jeolla-do but she’s lived there for decades. When she found out my parents were from the region, she grabbed my arm and greeted me like a true Jeolla-do grandmother. “Oh, my beloved grandchild, oh my dear, you came” in a high-pitched Jeolla-do slang and sounding exactly like the lively elderly women on my mother’s side. The whole table erupted in laughter at her spot-on impression. For the rest of the week, I was lucky enough to be folded into the daily life of her hermitage. Mornings typically begin at 6am for prayers and meditation. This ritual entailed prostrating myself 108 times and my right foot falling asleep without fail while sitting cross-legged during meditation. Then I would go back to my room, which was usually Jeong Kwan seunim’s study, make up my bedding on the heated floor and wash up in the bathroom with a bucket of ice cold mountain water. I have vague memories of bathing like this when I visited my grandmother in Gwangju as a child, but that was always during the summer, and never during the glacial Korean winters. It was painful and I’ll be honest, I may not have washed my hair every day, or even every other day. After prayers it was back to the kitchen to help set the table and prepare for breakfast. Everyone at the temple eats together, helps to cook and wash dishes, do the market shopping, sweep the outside paths, take out the garbage, and whatever else needs to get done. We spent almost every waking hour together at the temple, which was not what I had expected but was just incredible. Watching her cook was even more so. She makes everything from scratch with the help of her team. 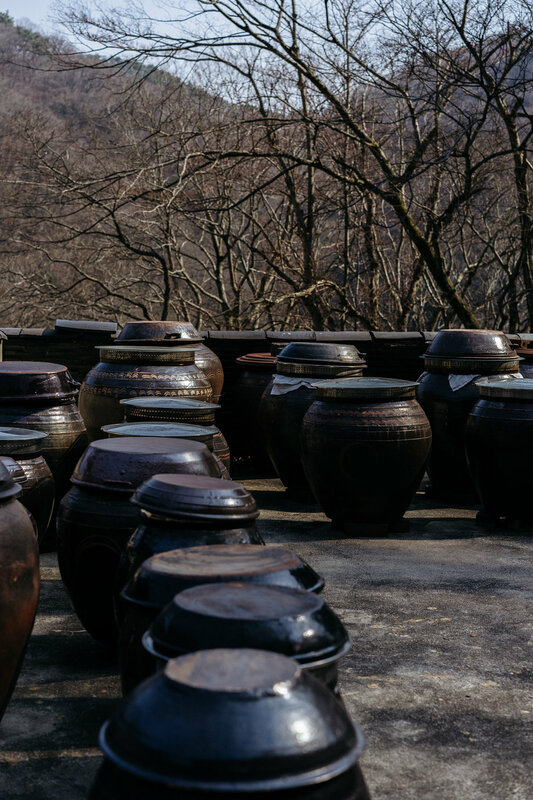 Everything – including soy sauce, vinegars, powders such as one made from dried perilla leaf and matcha, and soybean pastes fermenting in clay jars outside. Then there are the dozens of jars of pickles and kimchis filling up refrigerators all over the complex. The first thing that she handed me with her fingers to sample from a small jar was a sansho pepper leaf pickle that had been aged for over a year. It was maybe the most complex and delicious thing I’ve ever had. Jeong Kwan seunim uses her hands a lot when she cooks. So does Myojin seunim, the other nun at the hermitage (below), who also has an ease in the kitchen. This is a very Korean way to cook. We use our hands to feel closer to the food. When cooking, Jeong Kwan seunim even uses her fingers to scoop up whatever is in the pot with her fingers and place a sizable amount in her mouth to taste and check the seasoning. Without fail, she will proclaim “delicious!” like a joyful amen to the heavens. If Buddhists believed in heaven. Her joy of cooking is spiritual without a doubt. It seems to come from a deep place, like instinct. She is incredibly spontaneous and playful in the kitchen. Regional government representatives came to interview and photograph her one day while I was there. We helped her prepare ingredients for lunch with the crew, peeling vegetables and chopping an assortment of new spring greens. The interviewer asked her what she was making as Jeong Kwan seunim lifted the lid off a steamer pot and placed a cloth in the steamer basket. “I don’t know! I’ve never made it before,” with an impish laugh. She threw the lot of spring greens into a bowl, sprinkled glutinous brown rice flour and buckwheat flour and a handful of salt over the greens, mixing them with her hands. She placed the dry mixture into the steamer and placed the lid back on. Ten minutes later, a sticky tangle of greens came out of the steamer like a loosely constructed mochi. “It smells like spring,” and she smiled as the steam hit her face. The scent reminded me of my grandmother in Gwangju and her mugwort mochi that she pounded by hand and steamed, and I smiled along. Cooking for me, and I believe for Jeong Kwan seunim, is a family affair. It’s about caring for loved ones and strangers and creating a family over the table. We were a motley crew assembled at the hermitage that week, but we all soon felt like family, with teasing, laughs and sharing of stories over Jeong Kwan seunim’s table. It was fascinating to see what personalities Jeong Kwan seunim had drawn to her. Jeong Kwan seunim often referred to the small group as woori shikgu, our family. I think that whoever is there in that moment is automatically included, her heart is that open. On my last day at the temple, Jeong Kwan seunim asked me what I wanted to have for lunch before I had to leave for Seoul. I said anything would be delicious not because I was being polite but because I knew that to be true. She thought for a moment and then took down a pristine wooden box from a high shelf containing somen noodles given to her by a Japanese friend. 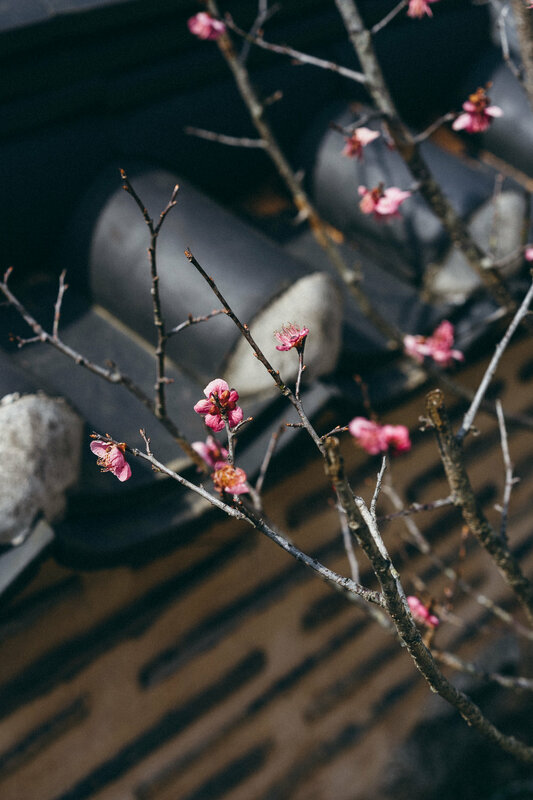 Myojin seunim, the other nun at the hermitage with the easy laugh and shared love of mochi, told everyone that Jeong Kwan seunim had been saving those noodles for a special occasion. We had a noodle soup with a clean vegetable broth spiked with fresh chillies that would not overpower the delicate noodles. 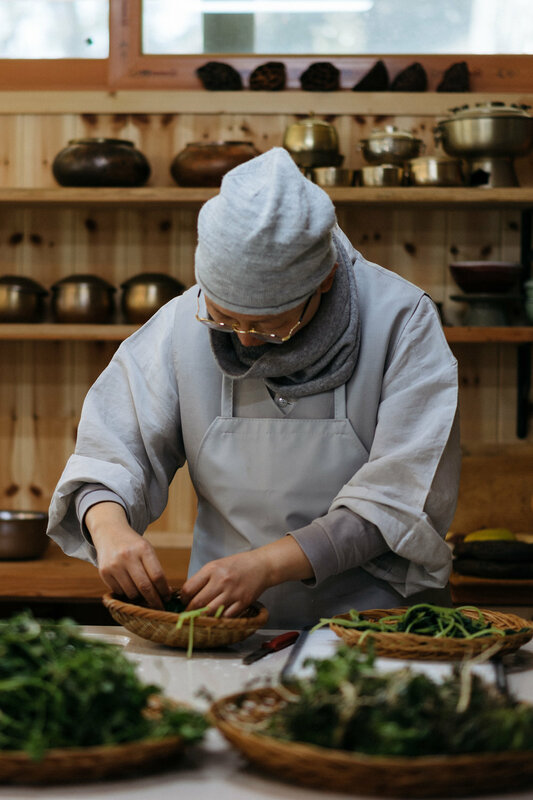 I watched Jeong Kwan seunim painstakingly dress each bowl with thinly sliced shiitake pickles and shredded rose-coloured kimchi. Her aesthetic sense is impeccable. She watched me try the noodles and asked me if they were okay. They were literally divine. I will be returning to the temple in a few weeks to help Jeong Kwan seunim prepare for Buddha's birthday celebrations. We are also planning a visit for her and her shikgu to Hong Kong including a couple of events so people there can experience her food and especially her joie de vivre in person. There is a lot of work to do, recipes to learn, greens to forage and laughs to be had. Stay tuned.